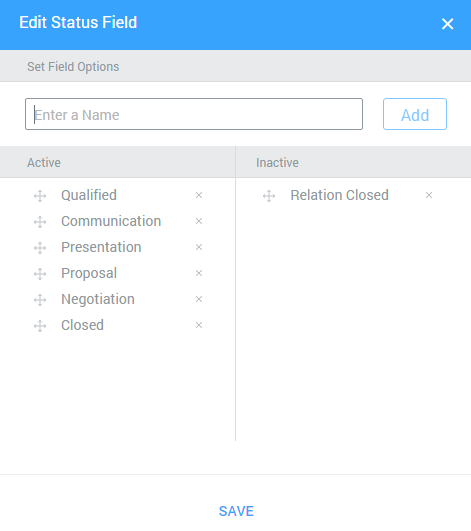 Manage your sales pipeline with the use of the statuses. Each list has basic statuses which can be freely adjusted to your needs. Active – the system monitors communication and users behavior within that relation. Inactive – the system no longer monitoring communication neither user activity within that relation. Enter the new status name. The status will automatically appear on the left side of the list as an active status. If you want to add an inactive status, move added status, using drag and drop method, from left to the right column. Read how you can change the status of each relation.